For now, all I’m putting here is scanned PDFs of the original magazines. Just click the images to open. The long term plan is to extract the content of the scanned magazines (either by technological means or plain old retyping) so that individual articles can be read without the need to download PDFs. This’ll also make it easier for people to link to individual articles if they want to. Exclusive interviews with Gorky’s Zygotic Mynci, Topper, Derrero, Melys, Llwybr Llaethog, Big Noise Recorders. Celebrity Corner with Richard Elis (Huw in EastEnders). 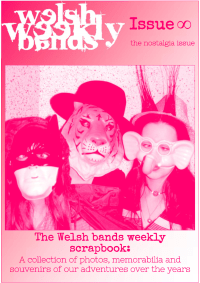 Exclusive interviews with 60ft Dolls, David Wrench, Ectogram, Stereophonics, Rheinallt H Rowlands, Feeder. Celebrity Corner with Howard Marks. Fantasy Flashing. 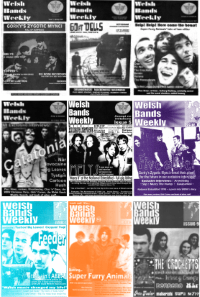 Exclusive interviews with Super Furry Animals, Verona, Serein, Welsh Language Society, Crac, Pic Nic, The Crocketts, The Honeydews. Fantasy Flashing. Exclusive interviews with Catatonia, Nar, Novocaine, Big Leaves, Cartoon, Tystion, Hush. Girls’ Corner. The WBW Awards. The WBW Christmas party. Exclusive interviews with Melys, Rachel Stamp, Armstrong, Doc Savage, Rhys Mwyn, Bruise, The Original Mind, Dragonfall, Zeros + 1s, Pink Assassin, Revelation. Inside Emma. Girls’ Corner. Exclusive interviews with Gorky’s Zygotic Mynci, Anweledig, Slip, Murry The HUmp, Gwacamoli. Eisteddfod 1998: WBW’s diary. Girls’ Corner. Exclusive interviews with Feeder, Tystion, Big Leaves, Oxygum, Twp. This Ain’t ABBA: The WBW tour of Sweden. Welsh Music Changed My Life. Inside Emma. Girls’ Corner. Exclusive interviews with Super Furry Animals, Topper, Scuba, Zabrinski, Picture The Beautiful, Patrick Jones, Dr & The Medics. 1999 festivals: Eisteddfod, Miri Madog, V99. Exclusive interviews with The Crocketts, Infinity Chimps, Nar, Derrero, Maharishi, Supa Myff, Pete Fowler. Inside Emma, Girls’ Corner. Cyfweliadau ecsclwsif efo Gorky’s Zygotic Mynci, Topper, Derrero, Melys, Llwybr Llaethog, Big Noise Recorders. Cornel y Bobl o Fri efo Richard Elis (Huw yn EastEnders). Cyfweliadau ecsclwsif efo 60ft Dolls, David Wrench, Ectogram, Stereophonics, Rheinallt H Rowlands, Feeder. Cornel y Bobl o Fri efo Howard Marks. Ffantasi Fflashio. Cyfweliadau ecsclwsif efo Super Furry Animals, Verona, Serein, Welsh Language Society, Crac, Pic Nic, The Crocketts, The Honeydews. Ffantasi Fflashio. Cyfweliadau ecsclwsif efo Catatonia, Nar, Novocaine, Big Leaves, Cartoon, Tystion, Hush. Cornel y Merched. Gwobrau BCW. Parti Nadolig BCW. Cyfweliadau ecsclwsif efo Melys, Rachel Stamp, Armstrong, Doc Savage, Rhys Mwyn, Bruise, The Original Mind, Dragonfall, Zeros + 1s, Pink Assassin, Revelation. Tu Fewn Emma. Cornel y Merched. Cyfweliadau ecsclwsif efo Gorky’s Zygotic Mynci, Anweledig, Slip, Murry The HUmp, Gwacamoli. Eisteddfod 1998: dyddiadur BCW. Cornel y Merched. Cyfweliadur ecsclwsif efo Feeder, Tystion, Big Leaves, Oxygum, Twp. This Ain’t ABBA: Taith BCW o Sweden. Newidodd cerddoriaeth Cymreig fy mywyd. Tu Fewn Emma. Cornel y Merched. Cyfweliadau ecsclwsif efo Super Furry Animals, Topper, Scuba, Zabrinski, Picture The Beautiful, Patrick Jones, Dr & The Medics. Eisteddfod, Miri Madog, V99. Cyfweliadau Ecsclwsif efo The Crocketts, Infinity Chimps, Nar, Derrero, Maharishi, Supa Myff, Pete Fowler. Tu Fewn Emma, Cornel y Merched.